Comment EasyDNS was the just the first of a number of global DNS operators who will be invited by a London IP crime unit to make one of their customer's domains, er, disappear. But the Canadian operator is standing firm. The City Police's new Intellectual Property Crime Unit (PIPCU) is issuing takedown requests, not orders. It can ask - but not "tell" or "order" - DNS operators to "disappear" errant customers, leaving the operators three choices: ignore, fold or fight. 1) We haven't taken down the domain. 2) We told them to get a court order. The crime unit's request to EasyDNS, a domain name resolution service based in Toronto, Canada, asked the firm to turn its attention to its customer TorrentPond – a Singapore-based torrent search engine. PIPCU invited EasyDNS to review its T&Cs to see if "material breaches" had occurred. Headed by economic crime veteran Detective Superintendent Robert Wishart, PIPCU was set up this summer with £2.5m funding for two years. It deals with both digital and physical economic crime: its first operation bagged a load of pirated DVDs. If the domain service does not comply, the PIPCU letter explains, it will forward the service to ICANN, which can remove its accreditation as a domain registrar - although only in exceptional circumstances. 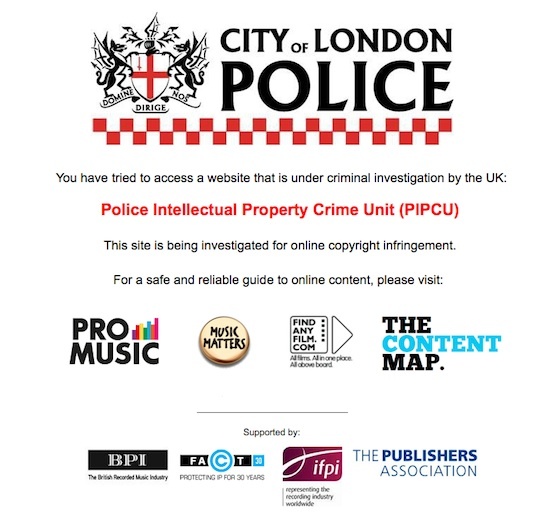 City of London Police has begun an initiative to target websites that attract visitors by providing unauthorised access to copyrighted content for criminal gain. These websites are able to operate and profit from advertising or other income on their sites without having licenses or paying the creators and owners of the films, TV programmes, music and publications. The initiative also seeks to protect consumers from malware and other harmful programs that may be downloaded unwittingly from sites that provide illegally offered content. Intellectual property crime is a serious offence that is costing the UK economy hundreds of millions of pounds each year. Working with the UK advertising industry, City of London Police and rights holder groups FACT (Federation Against Copyright Theft), BPI (British Recorded Music Industry) and The PA are committed to tackling this problem. "In other words, they are ordering us to take down competing websites, with no legal basis, hijacking the traffic, and redirecting it to competing commercial services, all of which are based out of (guess where?) London, UK," wrote EasyDNS's Mark Jeftovic in a blog post. Enforcement sources dispute this. Correctly, as it turns out, for nothing compels a Canadian domain registrar to take any notice of a letter from the UK police. EasyDNS also attempted to portray the takedown notice as an attempt by the police to "intervene" on behalf of a commercial operator against a non-commercial operator. But TorrentPond is every bit as "commercial" as HMV, and certainly pockets advertising revenue. The site showed a Bet365 advertisement when your correspondent visited it yesterday. This is the page to which PIPCU wanted the operator to redirect TorrentPond's IP address. The Register points out that it has not been proven that TorrentPond contains links to infringing material – which is likely why PIPCU urged EasyDNS to ensure no "material breaches" of its T&Cs had occurred. The Federation Against Copyright Theft, the movie industry enforcement group which investigates and takes private actions against anyone making pirated copyrighted content available on the web, told us sites which receive thousands of repeat takedown requests, but then ignore them, are in its sights. A FACT spokesman told us that torrent sites hosting infringing content could easily go legit and pay creators: "Operators of these sites make a conscious decision about the law." Measures detailing how to implement statutory web-blocking, which provides legal protections for intermediary services like ISPs, were passed in Section 17 and 18 of the 2010 Digital Economy Act, but were dropped – partly because the industry's private prosecutions had lowered the bar for removing a site via the courts. Rights-holders can now use Section 97 of the UK Copyright, Designs and Patents Act to speedily add a website to an ISP's block list. This was recently used to seek a High Court injunction blocking Kickass Torrents, H33T and Fenopy in the UK. The block isn't total (ruling here), but covers ISPs which cover almost 93 per cent of the UK market: BT, Everything Everywhere, O2, Sky, TalkTalk Group and Virgin Media.